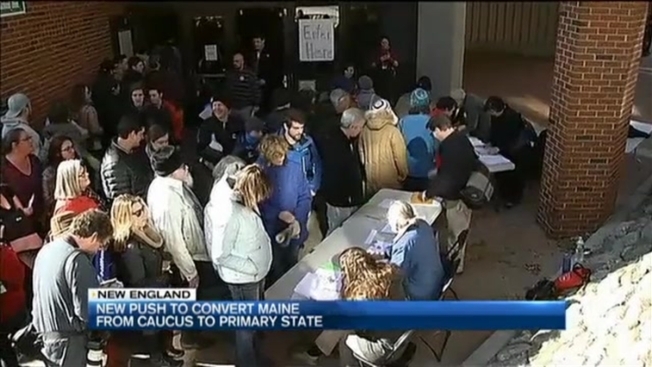 A bill that would replace Maine's caucuses with state-run presidential primaries is being endorsed by cities and towns and the state's top election official. A lobbyist for the Maine Municipal Association told lawmakers Monday that its 70-member leadership committee strongly supports a bill that would replace caucuses with primaries. Maine Secretary of State Matt Dunlap said a primary election should be scheduled on the first Tuesday after the first Monday in March. Senate Minority Leader Justin Alfond, D-Portland, submitted the bill after long lines at the Portland caucus this month caused some people to wait more than four hours to vote. Alfond said many voters were "disenfranchised." Opponents of the bill, however, urged lawmakers to keep the current system because they value the community engagement of local caucus meetings.